Salavatore Ferragamo has for a long time remained one of my favorite designer brands when it comes to finding a well-tailored and sleek menswear look. 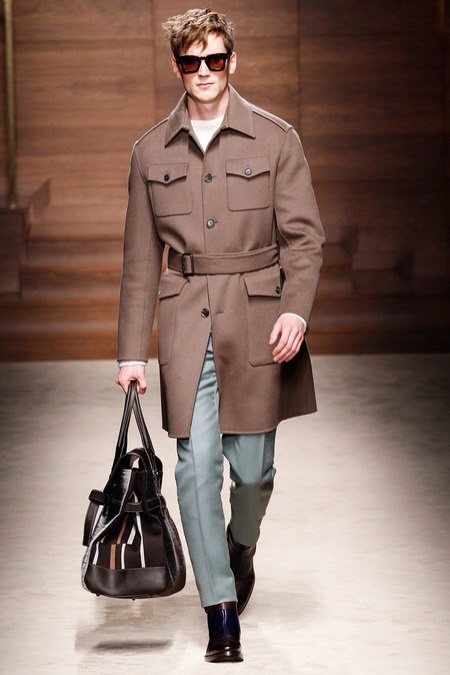 Their collection shown this weekend at Men's Milan Fashion Week for their Fall/Winter 2014 encompassed everything that I love about the brand; structured construction, sleek silhouettes, sophisticated palettes and everyday wearability. I always look forward to seeing how Massimiliano Giornetti injects a pop of color into every collection, this year adding details like graphic stripes as well as some bold combinations like deep oranges and blues. A trend that I saw which I very much enjoyed was the belting of jackets and outerwear pieces. Until next season Ferragamo, ciao !